As nonprofits, we can’t just throw up our hands. We serve missions that are intentionally designed to “make our world a better place.” Yet the data reveal that there’s a lot of work ahead for us here domestically. The United States currently ranks 19th – and is the ONLY major Western democracy on the underperforming list of the Social Progress Index, which measures factors like nutrition and basic medical care, water and sanitation, personal safety, and health and wellness. And a recent report from the Stanford Center on Poverty and Inequality documented how the U.S. scores at the bottom (10th out of 10) from among the world’s wealthiest nations for factors that included poverty, employment, income and wealth inequality, economic mobility, educational outcomes, health inequities and residential segregation. “Social progress” scored in those measures eludes us. Yet when we ask, “What can we do?” there is hope. We can address hard issues when we work together: nonprofits, philanthropists, and governments. Historically, nonprofits have served as places where people gather to collectively find solutions to social problems and advocate for social progress. * But solutions are less likely when nonprofits work in isolation. Social progress requires collaboration, collective advocacy, and having the courage to take a stand. In the wake of many of these incidents, nonprofits are on the front lines, helping communities to heal and creating a space for dialogue to find solutions. Several state associations of nonprofits have taken leadership roles to convene nonprofits with a wide variety of missions, along with local partners in philanthropy and government, for conversations that bring different viewpoints and experiences to the table to come up with solutions that make sense for the local community. Take some time this summer to explore what’s going on at your state association of nonprofits and engage in local conversations. Progress may not be swift, but we can achieve it by working together. *For an in-depth review of how nonprofits and the First Amendment rights of speech and association have historically played a role in social progress, we recommend this article by Jon Pratt in Nonprofit Quarterly, Battlefield History and Status: First Amendment Tensions between Nonprofits and Government. It takes bravery to tackle seemingly intractable social problems, and more bravery still for individual leaders to point out to their own community (that they care about deeply) where the community is letting everyone down. We are grateful for nonprofit leaders like Jatrice Matrel Gaiter for speaking up and calling out how racism, often due to ingrained, implicit biases, can invade charitable nonprofits and undercut the effectiveness of otherwise worthy causes. In her powerful opinion piece, Charities, Stop Stereotyping People of Color as Needy (Chronicle of Philanthropy, subscription required), Jatrice reminds us that depictions by nonprofits of people of color as the consumers of “charity,” paired with images of poverty, illness, and vulnerability, can become ‘caricatures with consequences,’ perpetuating a misleading image of whole groups of people as unworthy “takers” of services. She rightly points out that these derogatory stereotypes appear invisible to some who look at them but “don’t see color.” Instead, we all need to stop being color-blind in the name of equity, and follow her wisdom to “Use imagery that captures the vibrant contours of dignity and diversity of all people who are struggling to manage illness, age independently, find affordable housing, and escape hopelessness and poverty.” Each nonprofit’s journey towards equity should include a close look at webpages, brochures, social media, and fundraising messages. We all need diverse eyes reviewing our nonprofit’s materials. Any nonprofit can make a mistake. And every nonprofit can contribute to a more just society by mindfully projecting the values of diversity, inclusion, and equity in all its operations, programs, and practices. Communities depend on services provided by nonprofits; governments depend on nonprofits to provide those services; and philanthropists can only meet their missions through effective nonprofits. That’s why cross-sector collaboration is so powerful, and advocacy by nonprofits so essential. Social progress will never result from isolated efforts, or a silent sector. 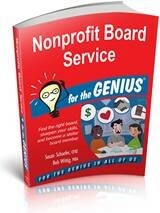 In the spirit of inspiring best practices for nonprofit board members, we’ve lined up a discount on an easy-to-read book, Nonprofit Board Service - for the Genius in All of Us (Nolo Press), that provides excellent grounding in the fundamentals of serving on nonprofit boards - and also offers inspiration and action steps for executive directors. We think it’s one of those books that every executive director will be eager to share with his/her board of directors. Purchase this insightful book using a special discount code: summerfun (lowercase). You can read it on a beach, the prairie, or in the mountains. Anywhere but in your office. It’s a big world. Get out there and enjoy it!.